I’ve been neglectful. I apologize. Sometimes life gets in the way of other things. Sometimes it’s so bad that you realize you have a wonderful story or recipe to share, but you haven’t. I planned to share this recipe a year ago, or close to it. My girlfriend Cathy makes this dish. She made it last year for her middle son’s eighth grade graduation party. In two weeks she’s having her oldest son’s high school graduation party. Like I said, I’ve been meaning to share this for a while. This is a great recipe for a large group. I made it and brought it to a good friend’s house for a cook out. So it’s a perfect pasta salad too. It tastes like stuffed artichokes. Yummy, right? I used jar artichokes. I buy them from Costco. 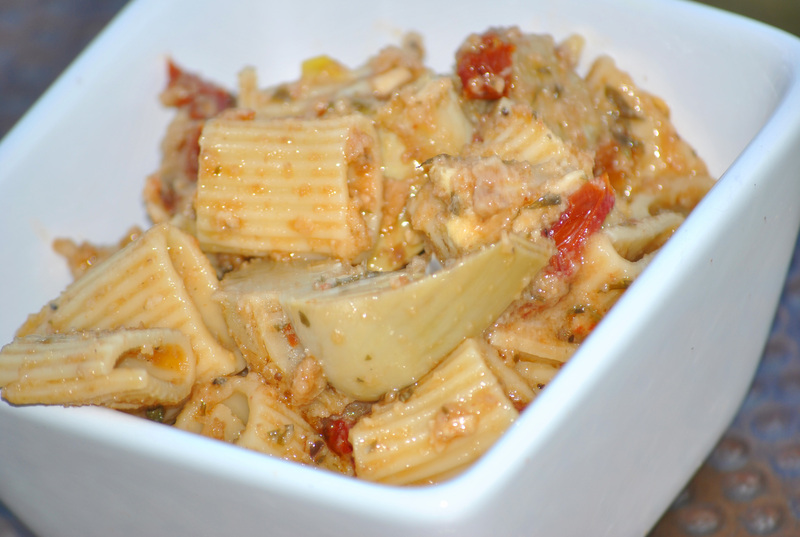 I used about 1 1/2 C of artichokes, and added enough of the liquid to prevent the pasta from being dry. Also, if you don’t plan to serve the dish right after tossing, hold off on adding the breadcrumbs. I’m hoping that with the start of my new job I can get back on track with sharing. The last two years were a blur. Mostly because my job, which was great, prevented me from spending as much time as I could with my family. Prepare pasta as suggested on package. In a medium saute pan, heat 1 1/2 T of olive oil and add garlic. 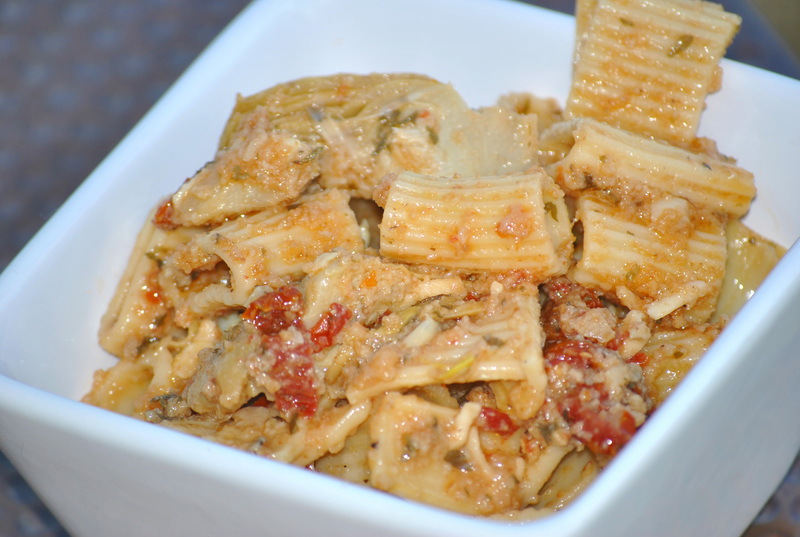 Reduce heat and add artichokes and sun-dried tomatoes. Stir in artichoke liquid, lemon, pepper flakes, parsley, salt and pepper. Simmer for 5 minutes. In a separate saute pen, stir the breadcrumbs in remaining olive oil until brown. Before ready to serve, toss pasta, artichoke mixture, breadcrumbs and Parmesan together. If you like this, please consider sharing it!